After World War II ended, and the occupation of Japan was over, people rebuilt their lives. The Japanese always remained exposed, however, to one constant danger. Their country's position, on "The Ring of Fire," makes them vulnerable to earthquakes (and the potential of resulting tsunamis). In 1923, for example, the "Great Kanto Earthquake" devastated both Tokyo and Yokohama, killing about 130,000 people. 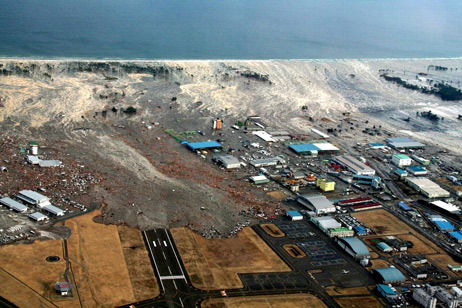 Tsunami coming ashore and causing destruction at Sendai Airport on March 11, 2011. Photo by Japanese Coast Guard. Japan is prone to major earthquakes because it is located near the boundary of the Pacific and North American tectonic plates. Movement of those plates can cause the earth to shake - sometimes violently. An earthquake is the vibration, sometimes violent, of the Earth's surface that follows a release of energy in the Earth's crust. This energy can be generated by a sudden dislocation of segments of the crust, by a volcanic eruption, or event by manmade explosions. Most destructive quakes, however, are caused by dislocations of the crust. Thrust faulting, on or near a subduction zone (where the plates come together), can cause one side to move up - then over - adjacent ground. Scientist believe such an event caused Japan's massive 8.9 earthquake on March 11, 2011. Beyond the horrors of the quake itself - which occurred at 2:46 in the afternoon (local time) - aftershocks typically follow. The combination of events can make it seem as though people are on a wave-tossed ship. Engineering techniques, however, continue to save many Japanese skyscrapers from destruction - causing them to sway instead of fall. Misery is compounded when the quake is a subduction event because a tsunami (this is another BBC animation) could follow. Often more deadly than a quake, tsunamis are rushing walls of water which slam into whatever is in the way. Buildings - vulnerable as match sticks - can be swept from their foundations and washed away by huge, fast-moving waves which travel to far-distant places. (The March 11th tsunami reached the harbor of Santa Cruz, California.) People are in the same predicament - unless they have been warned to seek higher ground. Ships, suddenly caught in monstrous waves, have trouble staying aright. While Japan has not been war-torn in recent years, its people have been battered by earthquakes. The 8.9 event, of March 11th, is believed be the worst in the country's history. Occurring off the east shore of Honshu (one of Japan's home islands), the epicenter was 80 miles (130 km) east of Sendai (a city of 1 million people) located in Miyagi Prefecture. When the wall of water followed, it inundated Sendai's airport, crippled the entire area and flattened some of the towns. Japan relies on nuclear power to supply its energy needs. (Follow the link to learn how that process works.) The quake's epicenter was 110 miles (178 km) east-northeast of the Fukushima Nuclear Plant, in Onahama city. That plant, like all others in the country, has emergency shut-down procedures in the event of an emergency (such as an earthquake). Sometimes, however, emergency procedures - including redundant protections - do not work as planned. Fukushima's #1 plant developed issues when the earthquake and/or tsunami cut power to the plant and back-up generators also failed. Then, on the 12th of March, the facility sustained an explosion. Thereafter, another explosion occurred, at Fukushima's reactor #3. Failures continued as cooling rods in reactor #2 were almost fully exposed. When cooling rods are exposed, temperatures rise and the threat of a meltdown increases. (Scroll down 40% for a video explanation of nuclear meltdowns.) The timeline of events, at Japan's nuclear facilities, reveals the serious nature of this problem. To prevent radiation escaping from the reactor's core and harming people - bringing to mind the Chernobyl disaster of 1986 when the meltdown of an improperly designed reactor occurred - workers at the Fukushima plant used several alternative methods to mechanically restore the water supply to the reactor's cooling system. It remains an open issue whether their efforts - and those of helicopters dropping water into the stricken reactors - will be successful. Concerns about a meltdown persist - follow the link to an animated explanation - while an exclusion zone surrounds the Fukushima plant site. Heroic workers, disregarding their own safety for the good of others, are known as the "Fukushima 50." To calm the nerves of his people, Emperor Akihito made a rare appearance on live television during the nuclear crisis. Deeply respected in Japan, the Emperor offered hope and encouragement to a troubled nation. As people around the world watched the unfolding disaster, "flags of our fathers" became "flags of us all" as offers to help the Japanese people poured into the country. Despite incredible hardships facing evacuees - in addition to seemingly endless and numbing losses - a few moments of joy surfaced amidst the personal and economic heartbreak. On the 13th of March, a sixty-year-old man (Hiromitsu Shinkawa) was rescued - nearly ten miles at sea - clinging to the roof of his home. He had drifted for two days. Bos, Carole "EPILOGUE - EARTHQUAKE in JAPAN" AwesomeStories.com. Oct 01, 2006. Apr 23, 2019.